Preparing your pond to install your pond liner couldn’t be easier. 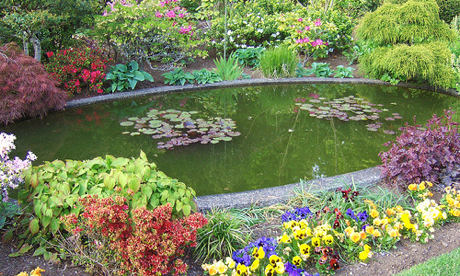 Here are a few key instructions to ensure the pond is ready to fill up and enjoy for many years. First task is to select the area of the garden where your pond is going to go. Ideally away from trees is the best option so you avoid any tree roots, and also with over hanging branches you will have the tree debris dropping into your pond which will of course create more maintenance of the pond. Select the size of the pond, the shape and of course the depth. If you are working towards a budget then a smaller feature would be suitable. Once you have the location sorted and the size, then it’s time to start the excavation. Clearing the pond area is extremely important before the pond liner is fitted. If you are looking for a retailer to get this done, I highly recommend Swell UK. The area needs to be clear of all roots, rocks, stones and any debris. Bamboo roots for example, need to be completely removed from anywhere near the pond, as the roots are extremely dense and could push through the pond liner. Once the area has been cleared you are pretty much ready to go. The pond liner will fit easy into the shape you have created. As with all pond liners you measurements will include an overlap. Depending on the pond you may wish to trench the liner. This means that outside edge of the pond has a small trench dug which the overlap will drop into. You then fill this area with the soil and then apply the lawn etc. This extra part will help keep the liner secure. This would only be filled with soil once the pond has been filled with water. Once the liner is in place you can then start to fill the pond with water. As the water level increases in the pond, you will notice the liner adjusting to the contours of the pond. You will need to monitor this process and adjust any areas needed. Once the pond is full, you can then fill the trench areas.